One of the most successful -- and subsequently most ridiculed -- pop performers of the 1970s and 1980s, and still an enduring figure on the adult contemporary scene, Barry Alan Pincus was given a start to his life amidst the urban splendor of Brooklyn's Williamsburg slum. Abandoned by his father at the age of two, Barry was raised by his mother and her relatives, eventually prompting him later in life to drop Pincus and assume her family's name, Manilow. At the age of seven he began to learn both the piano and accordion, and continued to be musically active throughout his high school years; after graduation, he chose to pursue music as a career and enrolled in the Juilliard School of Music while supporting himself with a mailroom job at CBS. Manilow's debut as a professional arranger arrived in his eighteenth year, when a director he had met at CBS approached him to arrange some public domain scores into a soundtrack for an off-Broadway production of The Drunkard; instead, the ambitious young composer created his own original score for the play, which went on to have a successful eight-year run. Manilow then landed a job arranging for the CBS series Callback, concurrent with a two-year residency as part of a duo act at Upstairs at the Downstairs Club in New York, and supplemented by commissions creating jingles for radio and television. A number of the most prominent jingles of the decade were written or sung by the man -- some so infectious in their quality that only by the end of the 90s did they finally begin to fade from public consciousness. After Callback, Manilow began working in various musical capacities for Ed Sullivan Productions, while also performing at the Improv in Manhattan and at the Continental Baths. It was through the latter that his career in popular music was given a lively kick in the pants courtesy of Bette Midler, who drafted him into service as her pianist and musical director. The duo's popularity steadily grew in the opening years of the 1970s, eventually leading to a series of appearances on The Tonight Show, and culminating in a sold out concert at Carnegie Hall in 1972. Response to his original songs at this event encouraged Manilow to put together a demo tape; a record deal was arranged with Bell Records (later Arista) soon afterward, and the first Barry Manilow solo release (Barry Manilow 1) was on the shelves by the summer of 1973. The release was not particularly well-received, but his involvement in Midler's hugely popular first two albums -- The Divine Miss M (1972) and Bette Midler (1973) -- helped to maintain his music industry profile. It was with his second album, Barry Manilow II (1974) and it's lead single Mandy, that the composer's solo career finally took off, the single finding its way to the top of the charts in early 1975. 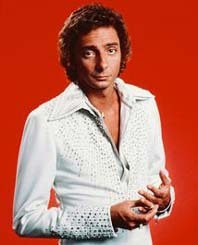 After this breakthrough, Manilow maintained a reign of terror over the American charts for the remainder of the decade -- his third album Tryin' to Get the Feeling (1975) reached triple-platinum status and earned a second number one single with I Write The Songs, and his fourth album This One's for You (1976) earned yet another with Looks Like We Made It. The obligatory double-live offering released in 1977 confirmed his popularity by hitting number one and reaching quadruple-platinum sales. That same year he received an Emmy award for his first television special (creatively titled The Barry Manilow Special) broadcast by ABC; Manilow specials were subsequently aired by the network every year for the following three years. The composer's streak of chart-topping singles continued up until the onset of the 1980s, attaining a total of 25 consecutive top 10 songs. A world tour staged between 1981 and 1982 broke attendance records in multiple countries, including five sold-out evenings at the Albert Hall; a second tour undertaken from '82 to '83 met with similar success. A change in his career was becoming evident at this point, however, and while he continued to draw large audiences at his concerts, his status with the record-buying public began to wane. Manilow responded by switching over to the big band genre in 1984, starting with the jazz standard collection 2:00 A.M. Paradise Caf�, recorded with veteran performers such as Mel Torm�, Sarah Vaughan and Gerry Mulligan. He continued on in this vein into the 1990s with the albums Swing Street (1987), Because It's Christmas (1990), Showstoppers (1991), Singin' With the Big Bands (1994) and Manilow Sings Sinatra (1998). In the 1990s Manilow continued to stage elaborate world tours, the content of which usually combined his interest in jazz and Broadway standards with the popular singles from his '70s heyday. A musical based on the latter material, Copacabana: The Musical, began to tour around the US and UK in 1994; a second musical, Harmony, followed in 1999, based on the struggle of the German male vocal group The Comedian Harmonists during the Nazi rise to power. Two ventures into film scoring were also made with the children's films Thumbelina (1994) and The Pebble and the Penguin (1995). The composer ushered in the 00s with a pair of Nashville-staged television specials -- one enlisting an extensive roster of country performers interpreting his songs, and the second featuring his own big band augmented by a choir. The critically well-received studio effort Here at the Mayflower surfaced in 2001, and a return to mass consciousness in the worst possible way was accomplished in 2004 through an appearance as a guest judge on the series American Idol. For a time the Arista label falsely claimed Manilow was born in 1946. Manilow appears as a senior in the 1961 yearbook for Eastern District High School, which would make him an improbable 15-year-old graduate should his birth year actually be 1946. The Tony Danza Show broadcast on 8 October 2004 produced a physical copy of this yearbook in an attempt to trap Manilow into admitting his real age. See also Patricia Butler, Barry Manilow: The Biography (2002), giving both the 1943 and 1961 dates.